The 2017 Honda Civic Hatchback is in stock here at Brilliance Honda, and if you want an upscale version of this sporty, efficient small car, then you need to learn more about the latest EX-L Navi trim level. This trim level delivers a huge number of desirable features that drivers in and around Elgin an d Crystal Lake will no doubt appreciate. The Honda Civic Hatchback EX-L NAVI gets the 1.5L turbocharged four-cylinder engine that produces 174 hp and 162 lb-ft of torque. A continuously variable transmission is standard and this powertrain earns a remarkable EPA estimate of up to 31 mpg city/40 mpg highway in EPA estimates. The Civic Hatchback in EX-L NAVI trim level gets premium features like leather trimmed interior, the unique Honda satellite linked navigation system, heated front seats, and an eight-way power adjustable driver seat, all of which are unique to this trim. Some other features that carry over from the lower level models include a 7-inch touchscreen interface, a power retractable moonroof, and a remote engine starter. You also get other highlights including Bluetooth Connectivity, Power accessories, a rearview camera, automatic headlamps, LED daytime running lamps, an LCD color touchscreen, USB connectivity, and automatic climate control. Come visit Brilliance Honda at 680 W. Terra Cotta Ave. in Crystal Lake, IL to test-drive the latest Honda Civic Hatchback. 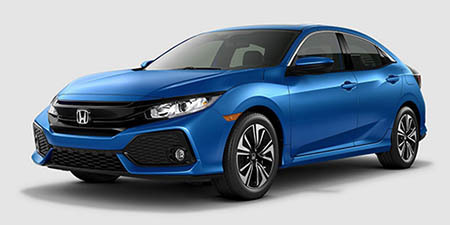 We’re your local Elgin area Honda dealer, and we have the Civic in stock now so visit us or contact us online now with to learn more about the latest Civic models!